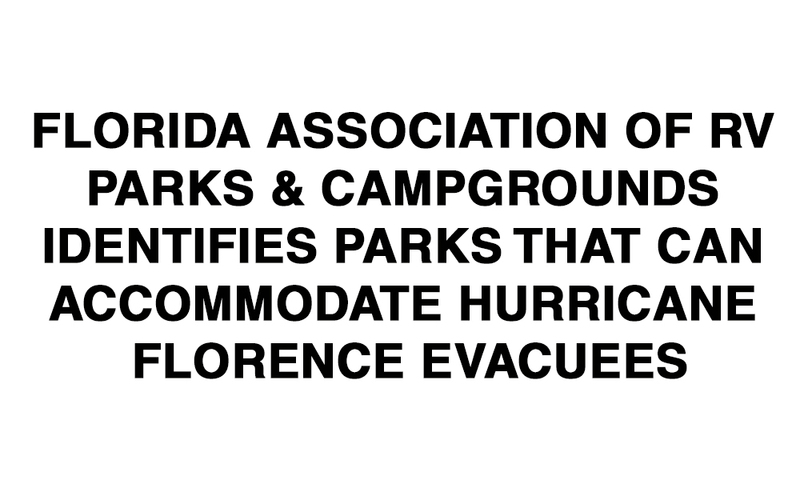 TALLAHASSEE, Fla., Sept. 13, 2018 — The Florida Association of RV Parks and Campgrounds has identified campgrounds and RV parks with space available for Hurricane Florence evacuees. “Most of Florida’s campgrounds and RV parks have availability at this time of year and are ready to accept evacuees,” said Bobby Cornwell, executive director of the Florida Association of RV Parks and Campgrounds. “It would be advisable, if possible, to contact the park ahead of time to reserve a space,” he said, adding that people can visit www.campflorida.com for listings and descriptions of over 400 Florida campgrounds and RV Parks. For more information on campgrounds and RV parks in Florida, please visit www.campflorida.com, or call Florida ARVC at (850) 562-7151.